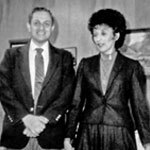 Howard and Fredelle Hoffman established Aurident, Inc. in 1974 with the business goal of providing the highest quality dental alloys at reasonable prices coupled with outstanding customer service. 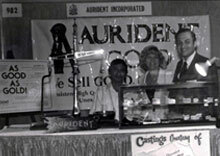 Since then Aurident, Inc. has maintained its reputation for consistent quality precious metal casting and ceramic alloys. Extending this philosophy to its other products, Aurident, Inc. researches, develops, and thoroughly evaluates potential new materials to assure compliance with its unparalleled standards. Aurident, Inc. has adhered to its quality standards throughout its history and continues to service the dental laboratory industry by broadening its products and services offerings. With the increasing demand for stabilized zirconia restorations the Delta Milling Center was formed. Aurident, Inc. continues to be managed by the Hoffman Family with Leonard Hoffman assuming increasing responsibilities for the company. The Hoffman Family is dedicated to maintaining its responsiveness and quality to the needs of the dental laboratory industry. Aurident, Inc. is registered with the FDA and is ISO 13485 compliant in the US and Canada. Membership in the Identalloy ™ Council assures every Aurident, Inc. customer an identifiable and consistent composition for each package of Aurident alloy. Aurident, Inc. products are registered in various countries worldwide. Visit this website to find new service and products as offered.